Why must we all work long hours to earn the right to live? Why must only the wealthy have access to leisure, aesthetic pleasure, self-actualization…? Everyone seems to have an answer, according to their political or theological bent. One economic bogeyman, so-called “trickle-down” economics, or “Reaganomics,” actually predates our 40th president by a few hundred years at least. The notion that we must better ourselves—or simply survive—by toiling to increase the wealth and property of already wealthy men was perhaps first comprehensively articulated in the 18th-century doctrine of “improvement.” In order to justify privatizing common land and forcing the peasantry into jobbing for them, English landlords attempted to show in treatise after treatise that 1) the peasants were lazy, immoral, and unproductive, and 2) they were better off working for others. As a corollary, most argued that landowners should be given the utmost social and political privilege so that their largesse could benefit everyone. Many people are paid very little to do backbreaking labor; many others paid quite a lot to do very little. The creation of surplus jobs leads to redundancy, inefficiency, and the bureaucratic waste we hear so many politicians rail against: “we have inspectors and people making instruments for inspectors to inspect inspectors”—all to satisfy a dubious moral imperative and to make a small number of rich people even richer. Sound utopian? Perhaps. But Fuller’s far-reaching path out of reliance on fossil fuels and into a sustainable future has never been tried, for some depressingly obvious reasons and some less obvious. 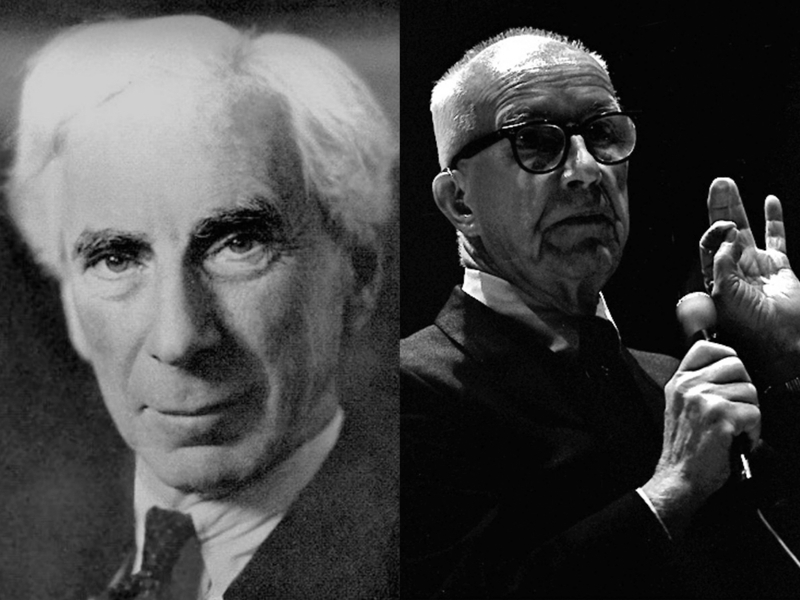 Neither Russell nor Fuller argued for the abolition—or inevitable self-destruction—of capitalism and the rise of a workers’ paradise. (Russell gave up his early enthusiasm for communism.) Neither does Gary Gutting, a philosophy professor at the University of Notre Dame, who in his New York Times commentary on Russell asserts that “Capitalism, with its devotion to profit, is not in itself evil.” Most Marxists on the other hand would argue that devotion to profit can never be benign. But there are many middle ways between state communism and our current religious devotion to supply-side capitalism, such as robust democratic socialism or a basic income guarantee. In any case, what most dissenters against modern notions of work share in common is the conviction that education should produce critical thinkers and self-directed individuals, and not, as Gutting puts it, “be primarily for training workers or consumers”—and that doing work we love for the sake of our own personal fulfillment should not be the exclusive preserve of a propertied leisure class.